featuring the works of Vivian Gunderson and others. Ten stories teach a different verse about sin. Paperback - $6.95, 64 pages. You may also email us and request a sales brochure. 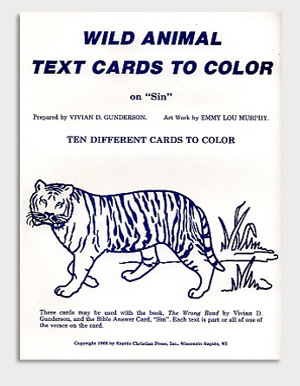 Optional 10-pack Wild Animal Coloring Cards. Each card contains a verse about sin that reinforces the messages in the book. Cards are printed on 8 x 11, heavy white card stock and packaged in a manilla envelope.